The Bloof mailroom is closed for the holidays until January 2. The store will continue to accept orders, but they will not ship until Jan 3. 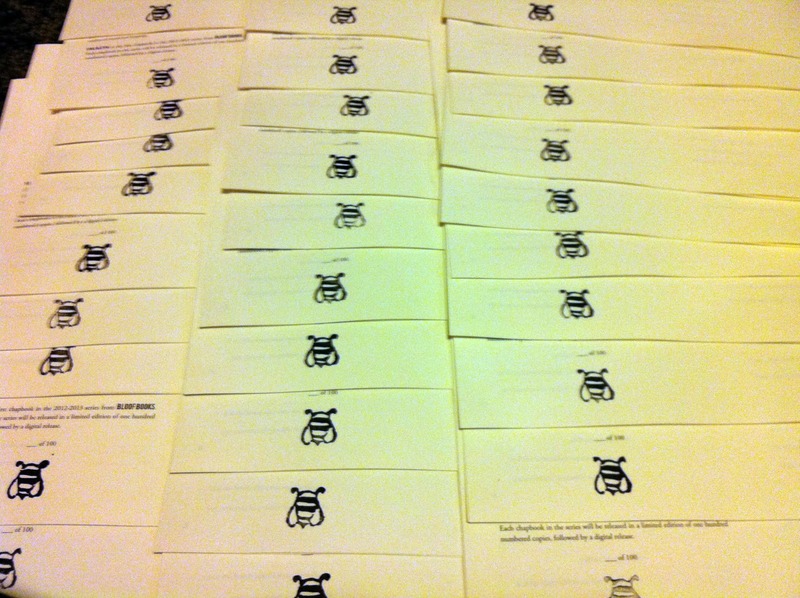 The handmade Bloof Bee stamp, to mark the colophon page. Some of the repurposed covers have marking or printing inside. Numbers 1-5 of the hundred. Number 3 is made from a recycled Priority Mail envelope. kraft cardstock left over from a chapbook project for Dusie. Allowing the stamps and numbering on the colophon page to dry. The range of color in the repurposed covers is just beautiful! Themed packing materials for Packing—also recycled. You asked for it, and now here they are. Just about everything in our catalog is covered. Go here to shop (or via the link in the main store if you need to browse first). 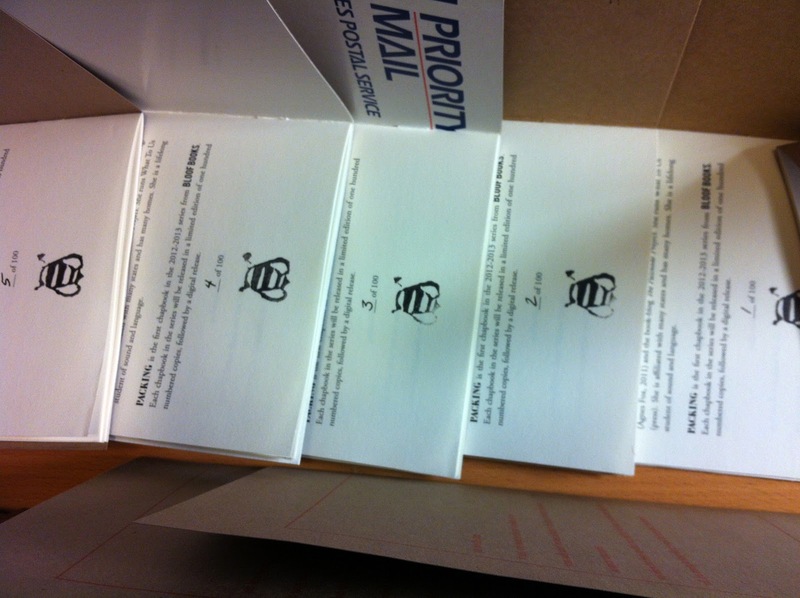 Q: Are review copies of the chapbooks available? 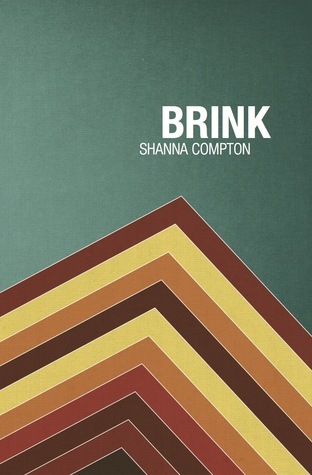 Q: I want to order THE WHOLE SHEBANG Subscription but I already preordered or purchased BRINK. Can I replace it with another paperback from your catalog? A: Sure, why not. Just let us know which book you'd like instead. And thank you! Our two newest releases, together. Quantity discounts on orders of multiple books. 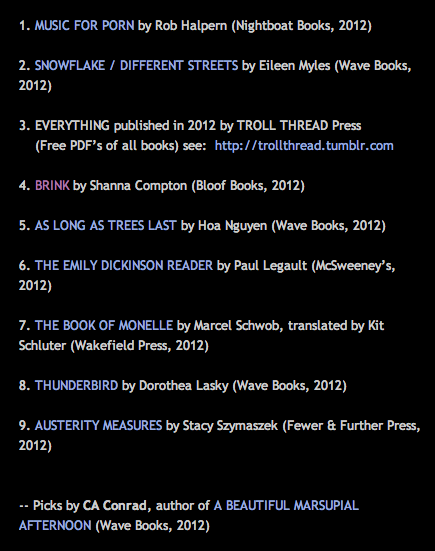 Applies to currently available books only (not chapbooks, not future releases). Shipping for bundles is at standard rates. Specify which books in Special Instructions during Checkout. 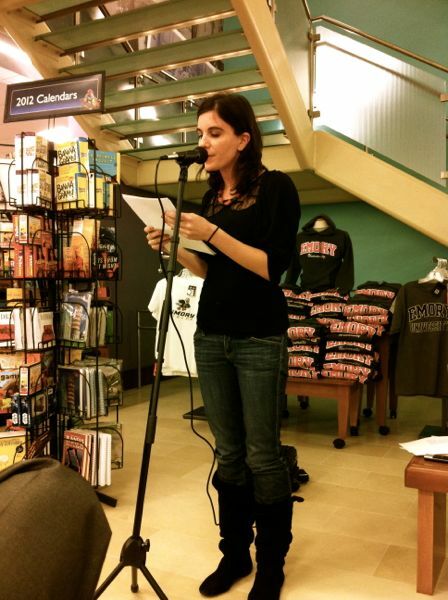 "Red Wand" by Sandra Simonds was chosen by Poem-A-Day readers as one of their favorites of 2012! 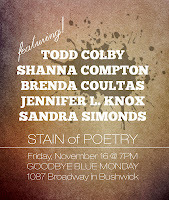 Check out the full list from the Academy of American Poets, below. "Red Wand" will be included in Sandra's forthcoming Bloof book House of Ions: Sonnets (2014). 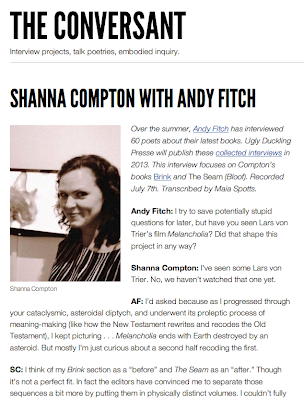 And Andy Fitch interviews Shanna in the December issue of the Conversant, about both Brink and The Seam (vol. 2 of the set, to follow next year). 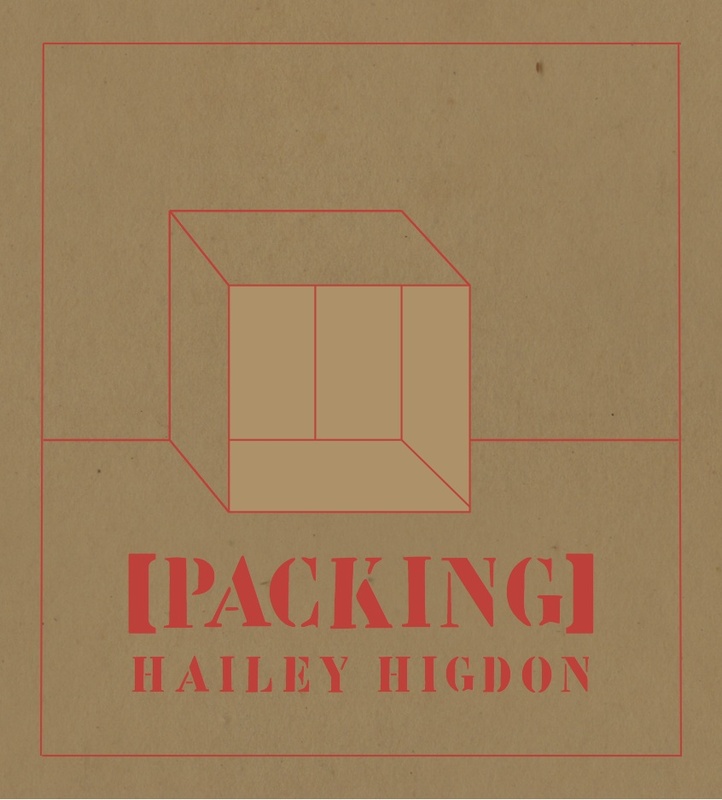 We're also getting ready to release the first chapbook from our new series, chosen during our Open Reading Period earlier this fall—Hailey Higdon's Packing will be available any day now. There will be only 100 printed copies of this limited edition, so if you want one, be prepared to act fast. 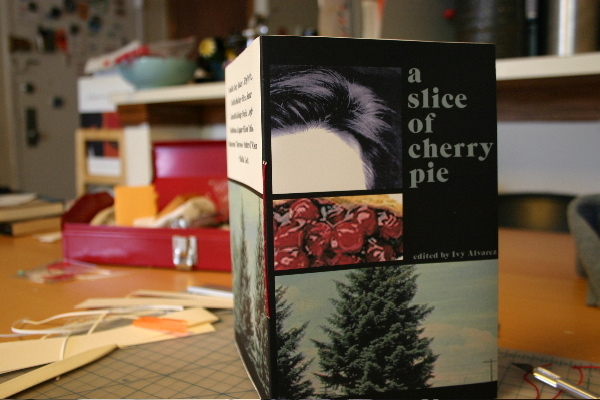 The design concept of Packing incorporated the use of recycled/upcycled materials (just like gathering boxes to pack for a move), so all the paper and most of the cover stock comes from previous projects, and the packing materials are themed too. Another aspect of the concept was to keep the book affordable and unfussy: a minimalist cover illustration, no frills formatting. Just great poems classically saddle stapled, five bucks. 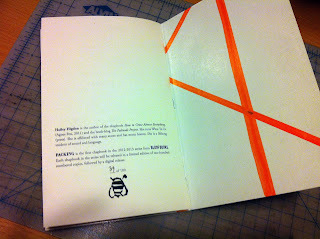 We couldn't resist showing off our new hand-carved logo stamp on the colophon page though. Next up, we've got Jared White's This Is What It Is Like to Be Loved by Me scheduled for February. We've started talking about the design concept on that one. 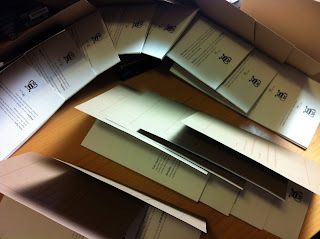 It's going to be Japanese-influenced, since the poems are loosely based on the haibun form. Sorry, no pics yet. Becca Klaver's Nonstop Pop & Jennifer Tamayo's Poems Are the Only Real Bodies are scheduled for March/April. 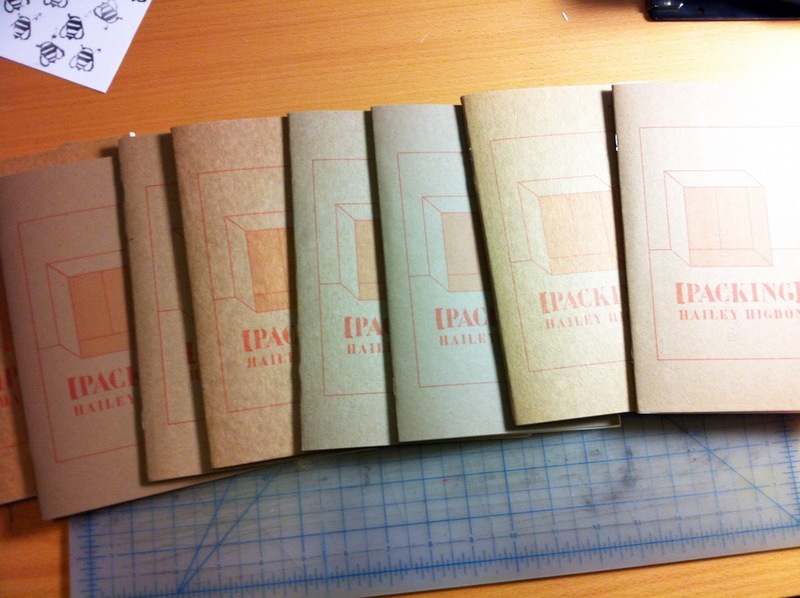 These (and Jared's) are also 100-copy limited-edition chapbooks. 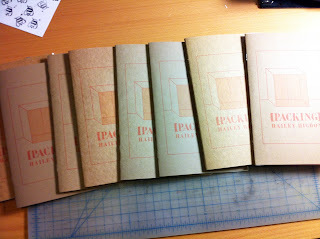 But we'll put aside a dozen or so of each for exclusive sale at AWP (table J6 with Coconut). Becca & Jennifer just got back from Georgia, reading for What's New in Poetry at Emory in Atlanta and Avid Bookshop in Athens, with Marisa Crawford, Lily Laedewig, and Hanna Andrews. 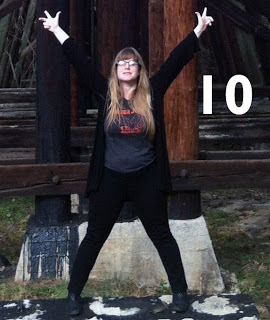 Bonus Becca: Listen to her audio poem for Day 10 of the Delirious Hem audio advent feature, curated by Susana Gardner. I just finished the beautiful and affecting Sleight by Kirsten Kaschock, and I can honestly say I've never read anything like it. It was a novel written in poetry, in dense, brief little chapters -- each one a rounded, shiny truffle with a spider lurking inside. Giveaway ends December 16, 2012. ...please do it using one of our alt listings that look like the screenshot below. We get a bigger cut this way (so we can print more books) and also the books that come from here are guaranteed to be correctly printed and bound. We've had a couple of reports of Amazon-ordered books having no spine text, fuzzy interior texts, and or random sections of other books stuck inside the bindings. They print and bind their copies themselves, so we have no control over them, alas. 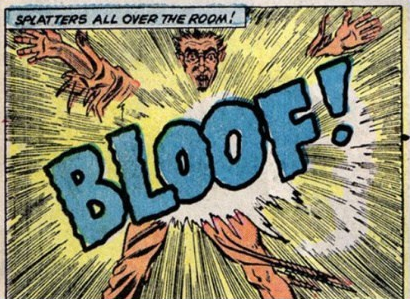 It's always best (most advantageous for the creators, including the authors) to shop via small press websites, independent bookstore partners, or from distributors like SPD (which we don't use but lots of our friends do). But if you must use Amazon, please do it this way. If you previously ordered a screwy copy of any of our books from Amazon, let us know, even if you returned it (and we hope you did). 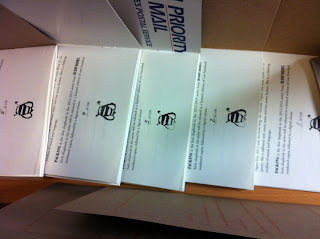 The books sent directly from us are from a totally different printer and look fantastic, promise. Originally published in Painted Bride Quarterly. This poem is from Jennifer's book A Gringo Like Me. You know you want it. Brink by Shanna Compton is now available for preorder. We're expecting books to begin shipping the day after Thanksgiving (11/23), with an official release date of December 15. But you can order it now for $5 off. Details here. 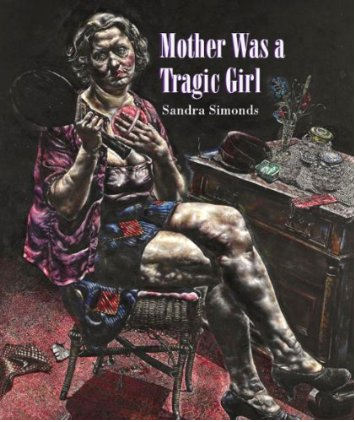 Sandra Simonds will be in Chicago Wednesday, November 14, reading at Danny's Reading Series with Betsy Wheeler & Hannah Gamble. Details here, or on our events page. 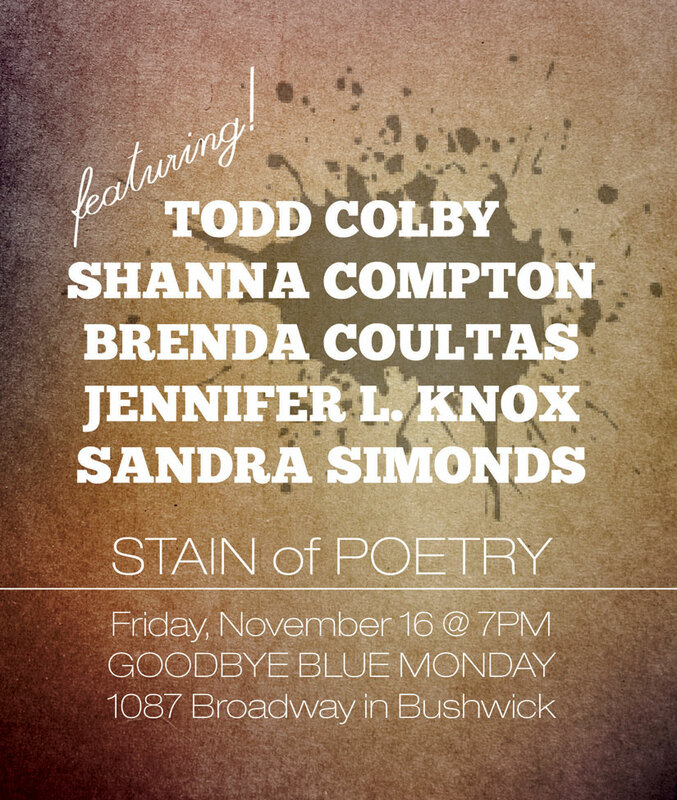 Sandra Simonds, Jennifer L. Knox & Shanna Compton are joining Brenda Coultas & Todd Colby for a reading in Brooklyn on Friday, November 16 at the Stain of Poetry. Details here, or on our events page. 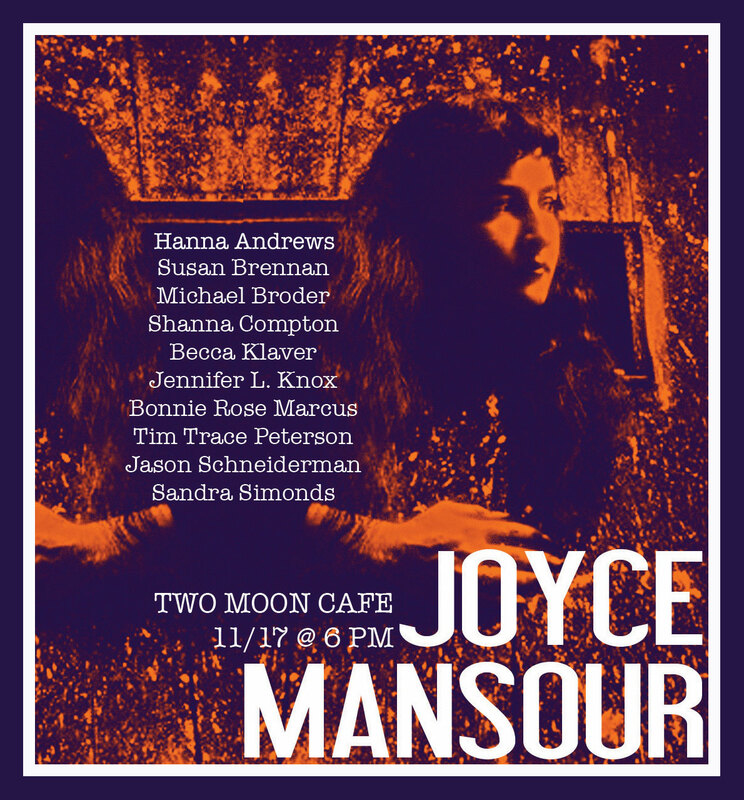 The next night, November 17 and also in Brooklyn, Becca Klaver, Jennifer L. Knox, Sandra Simonds, & Shanna Compton team up with Hanna Andrews, Susan Brennan, Michael Broder, Bonnie Rose Marcus, Tim Trace Peterson & Jason Schneiderman to celebrate the work of Surrealist poet Joyce Mansour. 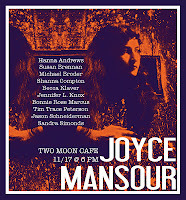 Each poet will read from Mansour's work as well as their own. Details here, or on our events page. 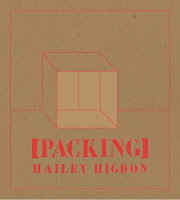 We're working on the first chapbook in our new series, Packing by Hailey Higdon. We've just chosen the cover design and acquired all the materials. We're just waiting on a delivery of fresh ink so we can start printing! It'll be in the store by the end of this month. 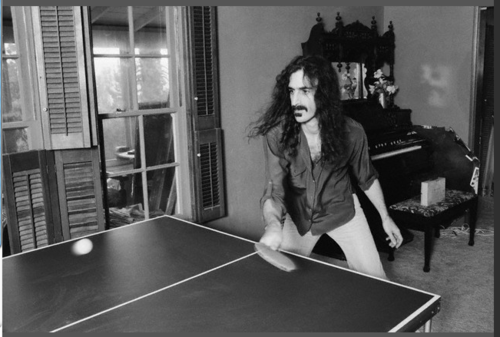 We're in production on TINA too, the new book by Peter Davis, doing the final round of edits and brainstorming cover ideas. That'll be going to press in January, we think, for a March release. Spellbinding: ostensibly a novel, Sleight reads like a critical theory treatise that’s been Pixared into plot and characters, with all the sentences personally airbrushed with the scrupulousness of Mallarmé. 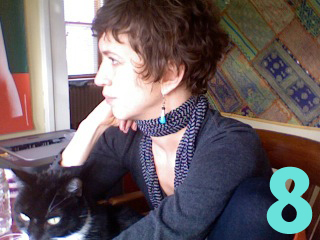 Bonus: Here's a new interview with Danielle Pafunda, at Pank. Jennifer L. Knox has pronounced her judgment in a recent round of HTML Giant's Tournament of Bookshit: Alcoholism vs. Everybody Has a Story. 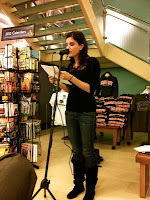 Danielle Pafunda has a new piece, "Fake-ish Memoir Totes Sincere, Unusually Embodied Affect Performance" at Montevidayo and some excerpts of her "novel under the sign of poetry" at Pank. 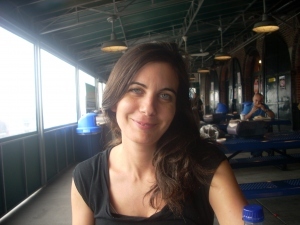 Sandra Simonds has new poems in the Boston Review and Open Letters Monthly. Peter Davis's Poetry! Poetry! Poetry! gets an enthusiastic thumbs-up review (the cover works!) from Rattle and has several poems featured in a recent issue of Atticus Review. 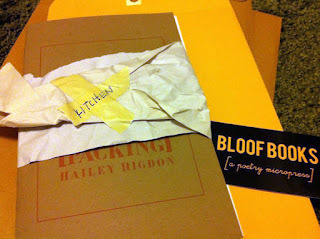 Finally, we remind you that our Open Reading Period for Poetry Chapbooks is still open. 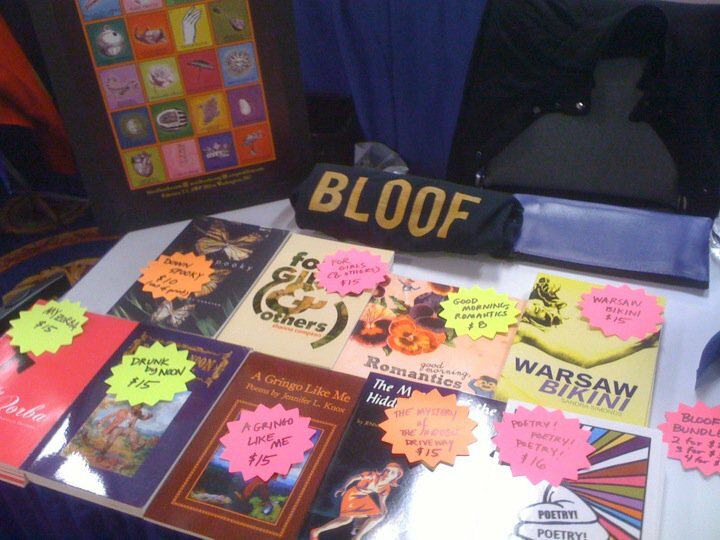 BLOOF would like our submissions to better reflect the diversity of our friends and peers in poetry. Right now our submissions (as wonderful and plentiful as they are) do not. 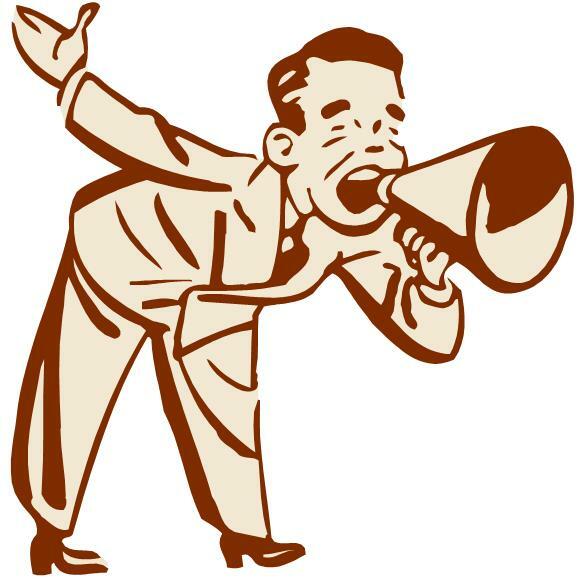 This is our first open reading period ever. Perhaps we have not yet made clear that though we focus primarily on innovative poetry by women, we are also actively interested in work by Human Poets of any race, gender, sexual orientation, spiritual philosophy, or ability? Well, WE ARE. This reading period is open to any poet writing in English (because that's the only language we read fluently enough to edit). There are 2 more weeks to go. But we are going to keep working on this long after. 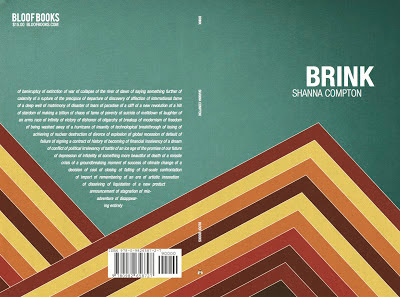 For Girls (& Others) by Shanna Compton. Two centuries of advice for girls, from Victorian health texts to Internet chat rooms, get remixed and satirized in this playful poetry collection with an underlying serious question: how to secure a space of enjoyment and dignity when one's identity is continually subject to public judgment." 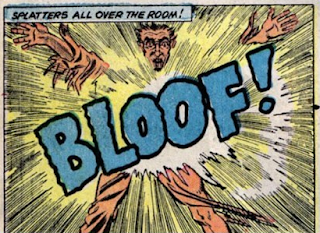 ...at the Poetry Society of America, here. Pete's got a new poem in Atticus Review. Read it here. UPDATE: Actually, he's the featured poet over there for the month of May. 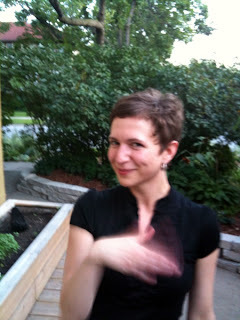 Here's the intro, by Michael Meyerhofer, as well as links to the other poems in the issue. Well, that was fun. We will be snatching the poems down now, to take them back to our laboratories for further poking and prodding. Perhaps some of them will appear again, in transmogrified book form here, or out there somewhere in the wild. 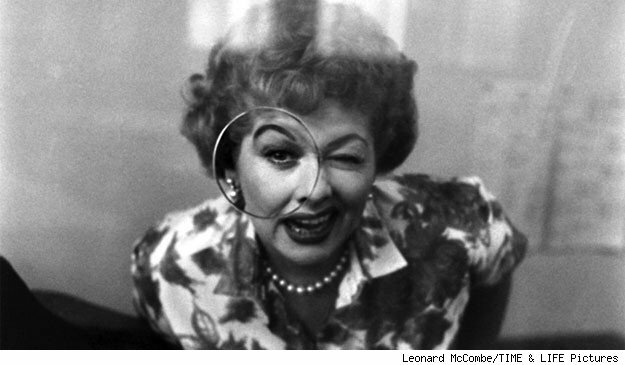 Our vintage Magic 8 Ball says: It is certain. 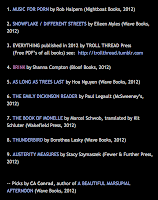 Thanks to Maureen for hosting this annual madness (and the feature link), Jennifer and the Best American Poetry blog for their feature links, and to all of you for reading!